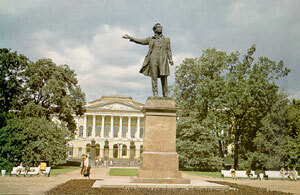 Monument to Pushkin on Arts Square. 1957, sculptor M. Anikushin, architect V. Petrov. Russian Museum (formerly the Mikhailovsky Palace). 1819 - 25. Artchitect C. Rossi.